Those who miss Rachel’s will be pleased by the new collaboration between pianist Rachel Grimes and French collective Astrïd. The latter provides the post-rock boost that was missing from prior Grimes albums, while the former provides the elegant tone that pushes the ensemble to a higher level. The first notes belong to Grimes, who sets the stage for a gorgeously elaborate set. 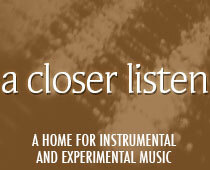 When the strings and drums enter seconds later, the listener is thoroughly engaged. “The Herald en Masse” even has a chorus, a light surge of strings that breaks the previous boundaries of volume and viscosity. Late in the track, the double drum hits provide a precursor of the post-rock ending. When the ensuing track opens with guitar, one realizes that these performers are taking turns, purposely showcasing the individual contributions of the expanded ensemble. At first, one recognizes the timbres of “Pierre Noire” (from 2015’s The West Lighthouse Is Not So Far), but then Grimes makes her appearance, and the mood is instantly lightened. These performers not only play well together, they seem to enjoy each other’s company, and their exuberance translates to their music. As the third track begins with clarinet, one is no longer surprised, but pleased. There’s no indication what “The Theme” is the theme of, so one is free to draw one’s own conclusions. The sedate, deliberate pace and tone of rumination suggests a late night walk in the mist. By saving the snare until the end, the ensemble is able to close on a hint of determination, which carries into the agitated “Mossgrove and Seaweed”, torpor exchanged for turgidity. As the album progresses, the mind grows as engaged as the emotions. The notes may be precise, but they are never stolid. One has the sense that a great deal of liberty is provided the performers, who capture the sense of improvisation even in the midst of a score.